"Convenient Concentrate" added every 6 months to the ice storage section of the system prevents mould and fungi and reduced the corrosion of these systems. Non- hazardous mould and fungus inhibitor for propylene glycol and ice bank reticulation systems. Proven to reduce corrosion and extend the life of glycol in a working solution by up to 5 years of normal use. Highly effective corrosion and mould inhibitor that will extend the life of a glycol or ice bank system. Will increase the life of propylene glycol in reticulation systems by up to 5 times normal use. Prevents the growth of mould and bacteria with in systems, eliminating corrosion and preventing blockages from jelly mould build. 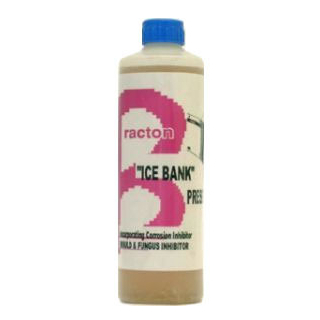 Add 5 litres of Bracton Ice Bank Preservative for every 100 litres of propylene glycol. If the propylene glycol has been diluted into a working solution,calculate the amount of working solution in the system and percentage of propylene glycol before adding Ice bank Preservative.